Is the weather outside unpleasant? Don’t worry! Enjoy these indoor group games and activities for kids on that rainy day. These ideas are sure to bring hours of entertainment and engagement. 3. Bean mosaic. Sketch design on cardboard. Cover small portion of design area with thick glue and arrange beans on top following the drawn shape. Fill in shape and continue until complete. Dry before placing upright. 5. Brain storm program, classroom, or family activity ideas for the month/year. 6. Build a house from cards; start by balancing 2 against each other. 7. Build a Lego/block /toy animal and people village; keep adding to it. 10. Compile a list of things you like to do at your program, home, school, and out-and-about! Put it in booklet form. Can you get to 100 or more? Complete the list with dreams and goals of what you’d like to do in the future! Illustrate if you like. (This can be an on-going project). 11. Cooking: pizza, smoothies, desserts, something ethnic, candy, tomorrow’s snack, no bake, anything! 14. Creative story on long roll paper. The procedure is the same as above; however, it is written on paper. Have each child use a different color marker and stop in mid-sentence, until the last sentence completes the story. This can be on-going. 15. Design and buld with Popsicle sticks/tongue depressor sticks. 16. Dramatic play day! Do you have equipment/supplies to play: House, Acting/Movie Star, Bank, Court, Doctor/Nurse/Hospital, Animal Hospotal, Office, Restaurant, School, Travel, T.V. News/Weather? 19. Group draw. Have groups draw together on one large piece of paper… self-portraits are an idea. 20. Graffiti Wall. Put up a large sheet of roll paper in area where there are no black/whiteboards. Write title ‘Graffiti Wall’ on it. Put any sub-title you like. It can be Draw on Me, Write on Me or change it every week with sub-headings of …Things That Make Me Happy! Favorite Things to Do, Pet Peeves, etc. (Good for sharing feelings). 22. Guess how much it will rain! Put a cup outside and measure it when it’s finished raining. You can also leave cup out overnight. Make a chart for estimates; closest estimate gets a prize. 26. Invention bags. Fill bags with identical items for kids to create something original–1 bag for 1 to 3 children. 27. Jewelry making: yarn, cord, beads. 28. Jewelry making: cord or ‘licorice string’ and life saver candy and/or Froot-Loop/Cheerio cereal. 30. Jump rope marathon (contest with self-beating your own highest score). 32. Lanyard lace or Lanyard and pony beads. 33. Learn new card games; play favorite card games. 35. Learn/practice magic tricks-then have a magic show! 36. Learn/practice playing with a yo-yo. 38. Line dancing: Limbo, Conga line, Hokey Pokey, YMCA, Macarena, Chicken Dance and Hustle. 40. Magazine Scavenger Hunt: Divide the children into groups or individually. Give kids a list of things that would be found in magazines. Children search, cut, and glue items to sheet of paper. 41. Make a god’s eye with yarn and Popsicle sticks. 42. Make friendship bracelets from embroidery yarn. 43. Make some original word-search puzzles. 44. Make a Theme wall mural. 45. Make your own video. Pick a topic, write, practice, direct, shoot! 46. Make play dough….goop/gak/flubber from favorite recipes. 47. Make puppets: bag, paper plates and sticks, socks, mittens, lunch bags, foam and felt. 48. Michelangelo Painting: Tape large pieces of paper to the underside of tables or desks. Put out a variety of art supplies. Kids paint/color/draw lying on their backs-just like Michelangelo did! Discuss how he spent four years doing this to complete the Sistine Chapel frescoes. 49. Music /dancing of own choice. 51. Teach/Talk Pig Latin: To all words beginning a vowel (a-e-i-o-u, add the syllable ‘way’ to the end of the word. ‘Eat’ becomes eatway and ‘over’ becomes ‘overway’. For words that begin with a consonant, move the first letter of the word and add it to the end–add ‘ay’ after the consonant. 55. Paint to music and how it makes you feel. 56. Paper airplanes-Make them and then fly them in the gym. 57. Plan a family event. 58. Plan a morning breakfast. 59. Play ‘Follow the Leader’. 60. Play, Skit, or Puppet show: Write, Produce, Practice, Perform. 61. Play or skit from a favorite short book, poem, or chapter book. 63. Play some lively background music (or soothing depending on the emotional climate of the room); it often cheers up a rainy day! 64. Pound nails in boards. 65. Pound nails in a tree trunk part – at different levels for a unique art object. This can be on-going. 66. Pull out easel and paints. Paint Recipes here…tons of Fun Art ideas here. 67. Rain Art. Kids put on rain gear and take heavy duty paper plates outside. Sprinkle a few drops of food coloring onto plates and watch as designs appear. For a batik effect, first draw on the plate with white crayon and then add the food coloring. 68. Random Acts of Kindness: Decide on a RAK activity. 69. Relay Races. Play inside instead of outside! 70. Relay Races wearing mittens where objects are on a spoon. 71. Reverse writing. Take a sentence or paragraph and try to write it backwards. 72. Rhyme Time–Think of words. Children take turns seeing how many “real” rhyming words they can think of. When one word is worn out, choose another word. Remind them ‘nice’ words only! Spring, ring, bring, thing, fling, ding, king, ping, sting, and zing! 73. Run laps around the gym. 74. Shaving cream—put some on a flat surface and paint in it using finger tips. 75. ‘Simon Says’. Play ‘Simon Says’ based on the season or theme: ‘Bunny Says’, ‘Elf Says’, ‘Santa Says’, ‘Pumpkin Says’, etc. 76. Sing some favorite songs; sing in rounds. 77. Spaghetti painting: Cook pasta with some cooking oil added. Allow a handful of pasta for each child, Drain rinse, cool. Shape pasta-cutting lengths as needed-and place on card-stock sheets. Cover with wax paper and a heavy book to dry flat. Pasta will adhere when dry. (Add food coloring to water for colored pasta) Other directions and ideas in Pasta Theme. 78. Spontaneous/Spur of the moment party. 80. Start a Community Service project. 82. Start a Paper Maché project. 83. Start a photo journal/Take photographs. 84. Start learning a foreign language. 87. Static Electricity–Rub a balloon vigorously against hair or a sweater. Chart how long it will stick to different items and laugh at what it does to hair. 88. Stickers: Use ‘office labels’ and kids decorate them with markers or paint. 89. Take apart a broken appliance; put the appliance back together or re-invent it. 90. Tape record voices. Ahead of time, tape record different voices. Play the tape at group time. Try to guess ‘who is who’. 91. Teach a craft (knitting, sewing, patchwork, leatherwork, woodworking, etc.). 92. Tell stories/add on stories. 93. Trace your body: fill with things about yourself-either drawn or cut out from magazines. 95. Trivia or Jeopardy— played tic-tac-toe style. 96. Try to learn the ‘ABC’s’ backwards. 97. Umbrella Painting. Rainy days on the way? Have interested children bring a solid color umbrella. Cover floor, open umbrella, decorate each section with fabric paint or pens. Let dry for a day before closing or using. 98. Use an overhead to project large pictures for kids to color/draw/cut for murals. 99. Treasure Hunt—remember to have ‘outside nature and buried treasure hunts’ on sunny days! 100. Watermelon eating (save seeds to spit outside for a sunny day contest). 101. Wild Hairdo Contest (one or two children do another’s hair). Have a ‘Hair-Fasion’ show. 102. Write an original (positive) rap song about your program or school. 105. Have you met ‘Flat Stanley’? Check out the Flat Stanley to get you going. 108. Use your ‘Raiy-Day’ Grab Bag! : Scoop leftover sequins, pieces of felt and pipe cleaners into zip-top bags and containers. When it’s full, challenge kids to use the contents of your “grab bag” to make something new, such as a collage or free-form sculpture. 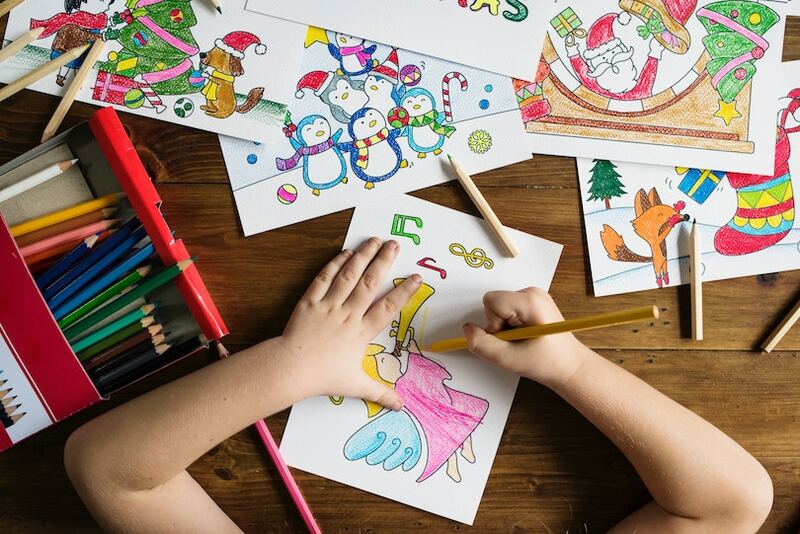 Larger pieces of unwanted artwork can be cut into strips or squares and used to make collage cards or decorate a back-to-school book holder or pencil pot. There you have it, 108 indoor group games and activities for kids. No need to worry about being bored on a rainy day. These activities are great a great way to stay entertained and have fun. Have some laughs along the way. You may also want to check out the Rain & Cloud Theme on this site.